Normally I don’t write much about myself but I have a reason to right now. 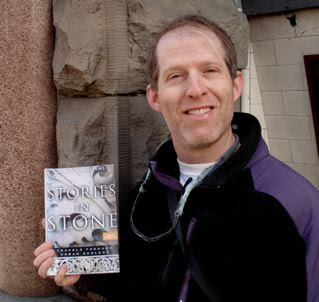 The advanced reader’s copy of my book, Stories in Stone: Travels Through Urban Geology, arrived yesterday. Stories in Stone weaves together natural and cultural history to explore the untold life of building stone. Each chapter focuses on a particular type of rock and describes my search to learn more about the stone, the particular building or building style that exemplifies its use, and the people involved in construction. Along the way I interviewed geologists, explored quarries, and consulted with preservationists and historians in order to give readers greater insight into these structures and stone they are made from. This is the first time a publisher of mine has produced such an edition, which is sent out to potential reviewers. Seeing the book has been very satisfying since this project began three and a half years ago when I first sent a book proposal to my agent. She and I spent many months fashioning the more formal proposal that Walker and Company accepted. I finished the initial manuscript about a year ago and after much editing, copy editing, and proof reading, it is now nigh unto its finished form, which has a publication date of June 23. Bravo, David! Looking forward to reading this. Is there a list of topics or areas that you covered? I’ve added this book to my wish list – it looks like it could make a great gift for a few people I know (besides me). Thanks all. If you go to my web site and click on the Stone page you can get details about the chapters. Looks great David – would love to see a copy. I will look for it on Amazon!